Baby massage has been a longstanding parenting tradition in many cultures, such as in India and Africa and has been introduced to the western world during the last 30 years, gaining in popularity in the UK since the late 1990's. Baby massage is when a parent lovingly strokes or holds their baby. Using a high quality, unfragranced vegetable oil, soothing holds and rhythmic strokes are given on each area of baby's body following a sequence which has been developed over many years. 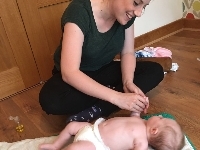 Massage offers a wonderful opportunity to experience a special time to communicate both verbally and non-verbally with babies so that they feel loved, valued and respected. Studies have shown that infant massage reduces post-natal depression. Studies from around the world have shown that massage can reduce abuse, aggression and violence.